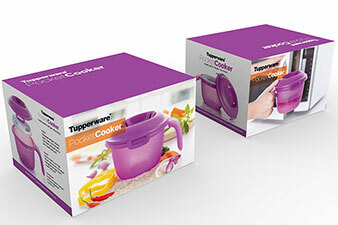 Tupperware aimed to launch a niche product for health-conscious millennials who belong to the microwave generation. This innovative cookware (3-in-1 cook, serve, and store) targets young, urban millennials and it was necessary to develop a creative design that appealed to them. Bright, fresh and dynamic. We used a trendy flat lay composition with fresh ingredients to highlight the purple color of the product. It was also important to demonstrate how easy, fun and healthier it is to cook with the Pocket Cooker. 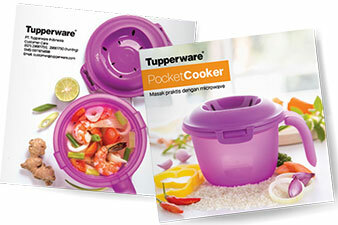 As consumers are usually unfamiliar with a new product, it was necessary to develop a functional booklet to demonstrate the ease in which the Pocket Cooker can be used, together with easy-to-make cooking recipes. 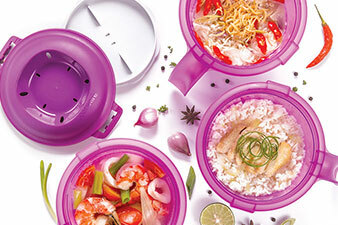 The packaging design had to be both functional (show the product breakdown, how it is used, and emphasize the unique selling point of the airflow design to maximise the cooking process) and attractive (immediately catch the attention of young millennials in a competitive space).